The instability of our current world requires rethinking the conventional career plan. 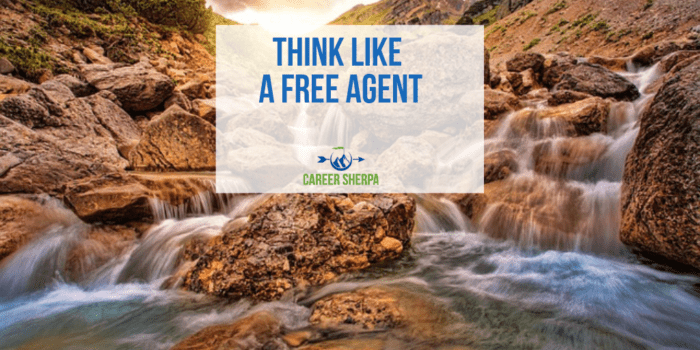 Are you ready to think like a free agent? The fluctuation in the stock market, the steady downsizing of businesses, the hesitancy of businesses to add new employees. The wage increases that barely help ends meet. The economy is not stable, nor has it ever been. There are ups and downs. These things are all beyond your control but greatly impact your life. Where is this all going next? I don’t know. But what I do know is that if you continue to think about your career as stable, you’re going to be in for a big surprise. Gone are the days when getting a job with a large employer means stability. Relying on a single income stream makes you vulnerable and puts your income at the whim of your employer. My main message is to start thinking like a free agent. If you’ve read my blog before, you know I’ve written about this topic. If you haven’t read these posts…go have a look! At What Point Do I Take “Any” Job? Now that you are thinking like a free agent and understand the necessity of having multiple income streams, start building your portfolio today…right NOW. If you are unemployed, take a temp or contract job. Do anything to re-engage in the working world. Think about the skills you have (and enjoy using) that could be sold as a niche service. For example, are you a whiz at product branding? Can you find startups that need help only with their product branding? Pitch them your services as a contractor. There are sites that list gigs as well. These sites allow you to search for contract work, side gigs, projects, etc. Fivrr allows you to post services (legal ones) that you would offer starting at $5. Go surfing and see what you can find!